The VR revolution is coming, and it’s not going to be what you expect. While VR gaming is considered to be the “tip of the spear” that will see the initial launch of mass-market devices like the Oculus Rift, the breakout application for the technology may not be gaming but video that allows you to look in any direction as the action unfolds around you in real time. With GoPro’s recent acquisition of VR video company Kolor, it is clear that by the time that the Rift hits the market they will support a ready market for virtual reality video. In theory, the ability to naturally look around in a panoramic view sounds simple, but in practice it’s game-changing – as significant an advance to the medium of film as the move from black and white to color. 360-degree video hitting the mainstream is still a few years away, but it will be a game changer for bricks and mortar retailers when it does. Virtual reality video will let them better leverage their traditional strengths – creating their own physical branded space and unique customer experience – in the online space. It promises to bridge the gap between physical shopping, and the convenience of online purchasing. Its 90% of the real-world shopping experience without the legwork. Virtual reality shopping will allow customers to walk through virtual recreations of real-life stores with near photo-realistic simulations, browse their inventory and make purchases. And by using video, the process of creating this will be cost-effective enough to allow retailers to update their virtual spaces on a regular basis, keeping pace with major marketing campaigns and changing products. It’s an impressive vision: video recorded brand ambassadors will be available as needed to discuss products and services, while personalized profiles will allow stores to essentially customize virtual layout and lead products to suit the needs of individual customers. But as always, the question with new technology is when virtual reality will achieve the critical mass necessary? Realistically, five-to-seven years might be an appropriate time-frame. But if companies have learned anything in the last five years, its that technological paradigm shifts can occur more swiftly than even their creators can anticipate. And while the costs of moving into this space early are quite modest by multi-national standards, the cost – in business, press and prestige – for arriving late may be more than most companies are prepared to risk. 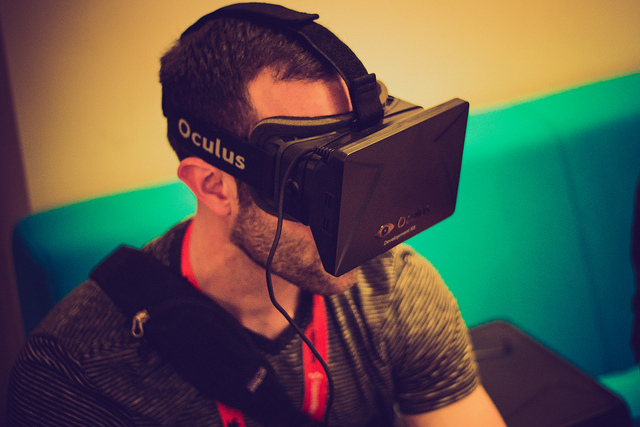 And with Facebook’s purchase of the Oculus Rift, there is the possibility that social media will be driving momentum to the early adoption of the technology in ways that we can’t readily anticipate. The early-adopter curve is normally gradual due to the ‘chicken and egg’ relationship between the ROI on content creation and the installed user base. Facebook’s acquisition has short-circuited this. Facebook has demonstrated a willingness to eat substantial short-term loss to build new long-term markets, and as Mark Zuckerberg noted after the purchase, VR represents a global online platform with applications in communications, live events, entertainment, video conferencing and long-distance education. It is not inconceivable that they will be prepared to lose billions selling the Oculus Rift units at a loss to shorten the time-frame to mass adoption, in order to own the medium. In summary, virtual reality video remains a novelty for now. But it may be ubiquitous before we know it. Smart retailers and businesses are going to want to make sure they aren’t late to the party.